Beautifully engraved RARE certificate from the New York Law Institute issued in 1850. This historic document has an ornate border around it. This item is hand signed and is over 154 years old. 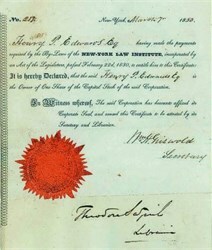 The certificate was issued to Henry P. Edwards, Esq. for one share and is signed by William H. Griswold as Secretary, and ??? as the Libraian. The certificate looks much nicer in person than the scan indicates. This is the first time we have seen this certificate. In 1854, Hon. Henry P. Edwards was a justice on the New York Supreme Court.